Gazprom is supplying gas directly to Ukraine’s breakaway regions and the dispute with Ukraine threatens Ukraine’s future territorial integrity. The current dispute with Gazprom over Ukraine’s gas deliveries is worrying – but not, as in the past, because of the risk of interruption of deliveries. The issue now is Ukraine’s very borders and the future of its east. The second Minsk agreement obliged the conflicting parties to reach a ceasefire by the midnight of 15 February; two days later, the Ukrainian army lost control of the city of Debaltseve. On 18 February Ukraine’s national oil and gas company, Naftogaz, stopped delivering gas to the two self-proclaimed states in the Donbas region – the so-called Donetsk People’s Republic (DPR) and Lugansk People’s Republic (LPR) – saying that pipelines in the east had been heavily damaged by the conflict. Russia reacted immediately to this shortfall in supply. Prime Minister Dmitry Medvedev asked Gazprom and the Russian energy ministry to come up with a solution to help restore gas supplies to the two breakaway regions directly from Russia. Gazprom immediately started supplying gas to the two regions through the “Prohorovka”and “Platovo” metering stations, which are not controlled by Ukraine. At first, it was thought that the gas was being sent on humanitarian grounds. But later, Gazprom suggested that it would subtract these supplies from the balance paid earlier for Ukrainian supply by Naftogaz. Gazprom was saying, therefore, that Kyiv must pay for the gas supplied to DPR and LPR, reasoning that the regions are part of Ukrainian territory. The gas flow pattern in the period from 18 to 24 February shows that in that time, it was Gazprom that supplied gas to DPR and LPR, avoiding metering stations and pipelines controlled by Ukraine. As a result, Naftogaz is not in control of the amount of gas that is coming into the two breakaway regions. Naftogaz’s CEO declared that the company would not pay for gas delivered to DPR and LPR by Gazprom. Meanwhile, Ukrainian engineers were able to restore the pipelines, and flows to the two regions were restored on 19 February. However, the gas flow pattern in the period from 18 to 24 February (Figure 1) shows that in that time, it was Gazprom that supplied gas to DPR and LPR, avoiding metering stations and pipelines controlled by Ukraine. Figure 1: Gas flows into the Ukrainian system according to Naftogaz. Source: author’s own construction based on data from Ukrtransgaz website. Usually, the entry point of Russian gas used by Naftogaz to supply Donbas is “Sokhranivka 1200”, a metering station located in Rostov Oblast (Russia). This station is near the border with Ukraine’s Lugansk region (the part controlled by Ukrainian forces). 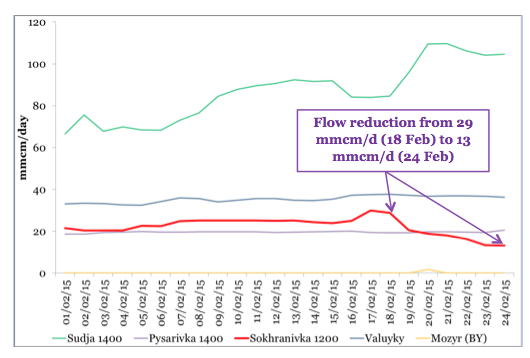 However, the flow through this metering station fell from 28.9 mmcm/day on 18 February to 13.1 mmcm/day on 24 February (Figure 1, red line). The reduction in pressure through this metering station started exactly at the time that Naftogaz stopped supplying gas to DPR and LPR. The average daily reduction in deliveries through Sokhranivka was 12.2 mmcm/day in the period from 19 to 24 February, exactly equal to the supply quantity quoted by Gazprom. This volume is enough to meet household needs in the breakaway regions: 5 mmcm/d is supplied to LPR and 7 mmcm/d to DPR. 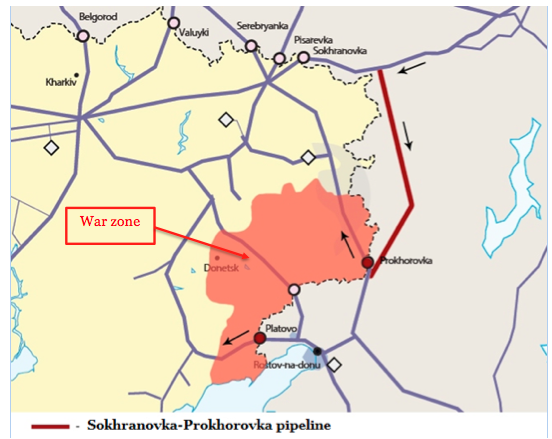 The supply to the two “republics” is organised through the bypass pipeline, Sokhranovka-Prokhorovka, which has been built on the Russian side of the border (see Figure 2 below). Figure 2: Supply from Gazprom to the breakaway republics. Source: Liga Business Inform. On 24 February, the gas dispute between Russia and Ukraine escalated further. Naftogaz accused Russia of breaching the terms of gas supplies under the “winter gas deal” by not supplying it with the amount of gas (114 mmcm/d) ordered by the Ukrainian company. By not fulfilling Naftogaz’s offtake requests, Gazprom has been trying to extend supplies to the two breakaway regions at Ukraine’s expense (using the gas already paid for by Naftogaz). For its part, by ordering the maximum deliveries possible from Russia, Naftogaz has been trying to avoid paying for gas deliveries made by Gazprom to DPR and LPR. Gazprom has warned that, if Naftogaz fails to make the prepayment, no gas will flow to Ukraine, which means that the risk of gas transit interruptions to European countries is high. As a result of the dispute, Naftogaz announced that it could not make further advance payment for gas in March. Gazprom has warned that, if Naftogaz fails to make the prepayment, no gas will flow to Ukraine, which means that the risk of gas transit interruptions to European countries is high. In preparation for today’s trilateral talks on gas supplies between Ukraine, Russia, and the European Commission, Naftogaz announced that it made a $15 million prepayment for gas in March, which is roughly equivalent to 45-50 mmcm of gas, thus trying to limit any accusations from Gazprom about risks of supplies to Europe. This minimal prepayment, according to Naftogaz, entitles the company to receive Russian gas until 5 March (10 mmcm/d from 1-5 March). But if the two parties cannot agree on payment for gas supplied to DPR and LPR, no gas from Russia might flow to Ukraine beyond that period. However, this is not a problem either for Ukraine or for Europe. Figure 3 shows Ukraine’s daily gas balance in a warm weather scenario. Persistently cold weather seems unlikely in the next couple of months, given that for the last two winters, the weather has been exceptionally warm across Europe and Ukraine. Even without Russian supplies after Naftogaz’s advance payment runs out on 5 March, the next two months should be safe for Ukraine and Europe. A period of gas shortage could take place in late April when storages are depleted, but this would be minimal – the shortage does not exceed a maximum of 1.5 mmcm/d and given that it would be April, rather than December or January, Ukraine could easily cut consumption to ensure it could meet its needs without risking supplies to Europe. Furthermore, there is spare capacity on the Hungary-Ukraine entry point – although recent statements by Hungary’s Prime Minister Viktor Orban make it doubtful whether Hungary would increase reverse flow. 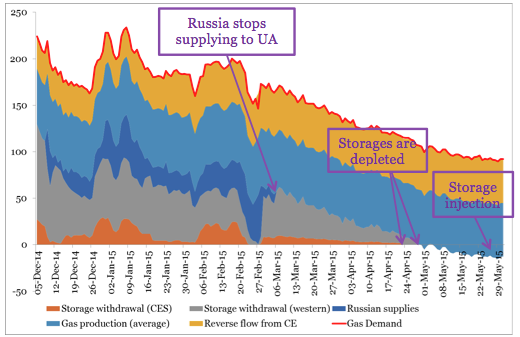 Figure 3: Possible gas shortages in Ukraine under warm weather scenario. It is of strategic importance to Ukraine that energy continues to be supplied to DPR and LPR. The case for the country’s territorial integrity will not be helped if the two regions are receiving energy supplies directly from Russia and thus have economic relations with Russia. The strategic rationale for maintaining energy supply to the two regions was confirmed by Ukraine’s President Petro Poroshenko: he stated that there are still Ukrainian citizens in the occupied Donbas territory and that the Ukrainian government must not leave their citizens without energy and heat. However, a major challenge in making supplies is that these self-proclaimed states are not paying their energy bill to the central government, putting enormous pressure on the state budget and exacerbating Naftogaz’s deficit. Ukraine’s Prime Minister Arseniy Yatsenyuk came up with a solution to the problem of balancing the strategic objective of maintaining energy supplies to the two regions with the objective of eliminating Naftogaz’s deficit. The central government has been delaying social payments to the citizens living in DPR and LPR until the issue of payment for energy supplies is resolved. The Ukrainian government hopes that the scheme whereby debt for gas supplies to the two breakaway regions is exchanged for social payments to households will create social pressure on the government of the self-proclaimed regions to abandon the “independence” movement. The Ukrainian government hopes that the scheme whereby debt for gas supplies to the two breakaway regions is exchanged for social payments to households will create social pressure on the government of the self-proclaimed regions to abandon the “independence” movement. If not, it hopes that it will at least force the breakaway regions to resume payments for energy supplies to the Ukrainian central government and Naftogaz. Kyiv is facing a policy dilemma between the risk of the de facto federalisation of Ukraine and the challenge of footing the enormous bill for the economic functioning and recovery of Donbas. The amount of debt owed by the two regions to Ukraine for energy supplies is increasing rapidly and has been estimated at 11 billion hryvnia, or $410 million. Continuing to supply gas to the two regions would cost Naftogaz $4 million (at current import prices), creating additional pressure on its budget. Thus, continuing supplies of gas to these regions “for free” would put at risk the receipt of extended financing from the International Monetary Fund – since one of the preconditions for receiving finance is to end Naftogaz’s deficit by 2017. It is possible that sanctions will be imposed on Gazprom if the company is supplying energy to the rebels and thus supporting the conflict in eastern Ukraine. By starting to supply gas to these two breakaway regions directly, Gazprom risks losing $4 million a day, unless it forces the two regions to pay for deliveries. This scenario is highly undesirable for Gazprom: the company cannot afford to lose more money by supplying free gas to these regions, in an environment of low oil and gas prices and competition in Europe from other suppliers (LNG from Asia is coming back to Europe). Moreover, it is possible that sanctions will be imposed on Gazprom if the company is supplying energy to the rebels and thus supporting the conflict in eastern Ukraine. Thus, Gazprom, if it is to continue supplying gas to the two regions, needs a framework to monetise and legalise the supplies. Indeed, Gazprom has in recent days proposed discussing supplies to the breakaway regions with Ukraine and the European Commission in a framework separate from the current arrangements under which Russia is supplying gas to Ukraine (the 2009 gas supply contract and the recent “winter gas deal”). Reportedly, the European Commission is also proposing discussing supplies to DPR and LPR separately from the “winter gas deal” that it helped to broker last winter. Naftogaz is determined not to pay for the gas that Gazprom is currently supplying to the two regions, whereas Gazprom cannot afford either to supply gas without payment or to run the risk of incurring sanctions. However, any such discussion would not be easy and deadlock is possible. Naftogaz is determined not to pay for the gas that Gazprom is currently supplying to the two regions, whereas Gazprom cannot afford either to supply gas without payment or to run the risk of incurring sanctions. If the parties cannot settle the issue of payments for gas to DPR and LPR, then Russia would most probably deploy the ‘”Transnistrian gas debt” scenario for Ukraine. Ukraine and the European Commission should avoid this scenario, as this would create a destabilisation point in Russia-Ukraine gas relations and hence impose unnecessary risk of gas supply interruptions to Europe in future. Chi-Kong Chyong is a visiting policy fellow at ECFR’s Wider Europe Programme. He is also Research Associate at the Energy Policy Research Group (EPRG) and Director of the Energy Policy Forum at the University of Cambridge. The author would like to thank Viktor Chyong for his exceptional research assistance and especially on crunching daily temperature data for all Ukrainian regions dating back to 1881 – the basis of our daily demand forecast in Ukraine for the coming months.